Nowadays, a major concern of mental health doctors regarding traditional therapeutic approaches (such as visiting the doctor’s office) is that they are confronted with a new phenomenon, specific to our time: the desocialization of their patients, especially the younger ones. Indeed, they grew up in a world where they were much more in contact with screens than previous generations. Thus, they have learned to trust the screens, sometimes more than human beings. However, it is not only young people who find themselves in this situation, since we have now been living for twenty years in a world where the use of computers is commonplace, regardless of age. And when social concerns arise in people who are used to screens, it is difficult to lead them to treatment, because therapy involves a social relationship: the one between the patient and the doctor. This is why new approaches are being invented and developed to adapt therapy to this new reality of the patient. A study by the Journal of Medical Internet Research, conducted by Kathleen Kara Fitzpatrick and Molly Vierhile of Stanford School of Medicine, in collaboration with Alison Darcy (Woebot Labs Inc.), compared two of these new therapy techniques « outside the doctor’s office ». The study method was to define two groups of 34 and 36 people, among a group of 70 participants, where one would use a chatbot (the Woebot) to follow a therapy, while the other would have to read an ebook, “Depression in College Students”, and serve as a control group, to study the success of the first method. The first method therefore consists in having the patient interact with a program, through instant messaging. The program has a pre-written script, and is tailored to the according situation (treatment of anxiety and depression). 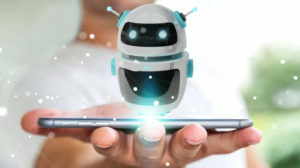 Through instant messaging, the patient has the impression of chatting with a human interlocutor, he/she can communicate in the same way, that’s why these programs are called conversational agents or, more commonly, chatbots. For two weeks, patients in this first group exchanged with the chatbot, while the second group read the ebook on a web-based interface. They were not required to complete the treatment. Thus, the natural tendencies to continue to use the tools given could be shown, this is called “adherence”. And in this study, it was found that the chatbot method was much more followed than reading the ebook. It had a lot more adherence. Patients in both groups completed this two-week study by answering the same set of questions. It should be noted that there was no significant difference between the two groups at the beginning of the study. The results speak for themselves: members of the first group saw their depression symptoms significantly reduce, while there was no reduction in the second group. It would therefore seem that the chatbot approach is very effective, while the “reading” approach seems to be almost not working. How can such a difference in results be explained? The study does not focus on explanations, but we can suggest answers based on the patients’ feedbacks. 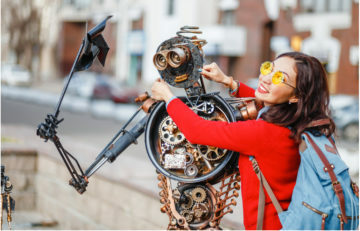 These indicate that the fact that the chatbot therapy is a process, and not a simple formal exposure, has largely contributed to its success. The “reading” method was criticized for merely copying the approach of traditional therapy, even though it is not given by a human being. So it is not an interaction, a process, whereas traditional therapy is given through a social interaction. The conversation with the chatbot, on the other hand, naturally includes the patient in his/her own treatment, pushing him to engage in his own recovery, especially since there is no figure of medical authority (which could frighten him or depossess him of his own care) to force him to go towards a solution of his own problem. The conclusion is that chatbots are an effective and engaging way to provide therapeutic care to young people, particularly in the case of anxiety and depression. Another study by Danielle Elmasri and Anthony Maeder provides the same conclusions for the treatment of alcohol consumption habits among 18-25 year olds. Scientifics are therefore in the process of developing this new approach to treatment, adapted to the patient’s context and natural tendencies (using instant messaging rather than reading a book on a computer). If web-based applications had already proven their effectiveness, they suffered from a cruel lack of adherence. Chatbots seem to provide a solution to this problem. Chatbots: What are they and how will they change the world?